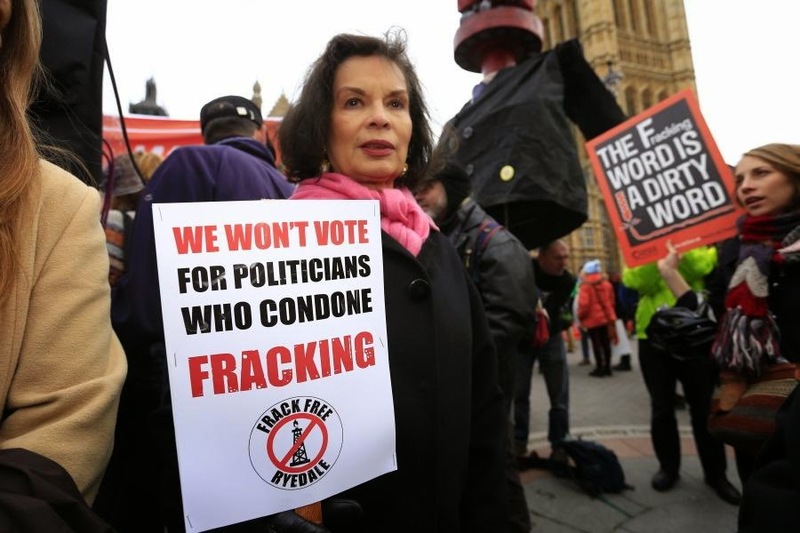 Campaigner Bianca Jagger joined anti fracking protesters during a protest outside Parliament on Monday, as a vote on a fracking moratorium were talking place inside. Photo credit: Jiri Rezac/Greenpeace. Members of the UK Parliament group, the Environmental Audit Committee, have in a report released last Monday called for a moratorium on the controversial shale gas extraction technology; fracking. This comes in the same week that Lancashire City Council in the North of England, was meant to have decided upon whether to grant fracking company Cuadrilla permission for two shale gas wells. On Wednesday the council said that they would need to defer the decision for eight weeks in response to legal advice. Half of the Environmental Audit Committee’s 16 members called for a moratorium on fracking in the report, which had been ordered following an inquiry on the environmental risk of the activity. The Committee consists of seven Conservative MPs, six Labour MPs, two Liberal Democrat MPs and one Green MP. In related news, on Monday, a cross party group of ten MPs also proposed a fracking moratorium motion in Parliament. One of the MPs, Labour’s Yasmin Qureshi, said: "The public have serious concerns about fracking that need to be listened to. In Lancashire where the council is set to decide on whether to allow fracking imminently, two thirds of the public are opposed. The Government should follow the example of New York and bring in a moratorium so that the risks of fracking can be properly assessed." That motion failed overwhelmingly when a majority of MP’s voted against it, including a large group of Labour MPs. However Labour did manage to insert amendments into the Government’s Infrastructure Bill that would tighten fracking regulation, which were subsequently accepted. Last week, Labour said that if they win May’s general election they will impose stricter regulations on the fracking industry, including banning fracking activities near water aquifers. But the UK government remains adamant that a fracking revolution should take place in this country, having unveiled a series of tax breaks for the fracking industry and saying it would be foolish not to relish the golden opportunity that a shale gas revolution would bring. Meanwhile Cuadrilla have asked for today’s Lancashire City Council decision to be deferred. Cuadrilla was responding to the news that planning officials were encouraging the council to deny the permit for the two wells and made amendments to their application. It was due to these amendments that the Council was asked to defer for eight weeks for legal reasons, angering anti fracking campaigners. The Council said they regretted the decision but said they were left with no choice due to the legal advice being presented to them.